Some of the Maui Pink Cap swimmers decided to avoid the windy conditions at our usual spot and do some exploring. 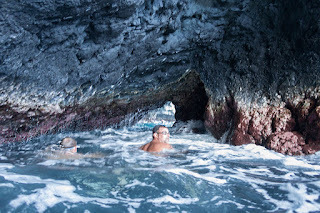 We headed out to the Pinnacle, then braved the unknown by swimming through the previously unconquered cave in the Wall. Whoo Hoo! First time experiences all around!